What Kind of Domestic Terrorist Can’t Even Afford A Real Pie? A WSJ Survey. On Sunday, The New York Times reported that the Wall Street Journal is sending surveys to its subscribers, asking them if a little scandal on the other side of the pond has affected their regard for the Journal. 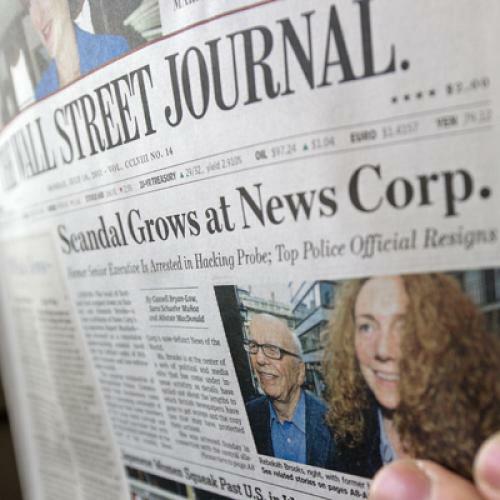 Have readers, for example, “heard or seen anything in the news or elsewhere over the past few weeks about News Corp. or News of the World, a U.K.-based tabloid?” Just wondering. And do readers know, the Journal asks, that Rupert Murdoch chairs the company that is the publisher of the Journal? Just curious. On a scale of 1-to-elitist-liberal-conspiracy, how would you rank the outcry against Rupert Murdoch? Can an executive with tens of thousands of employees really be held responsible for the actions of hundreds of them? How, if at all, could the actions of honest journalists be tainted by one tabloid’s excesses? When did you last change your voicemail password? Name your least favorite MP on the parliamentary culture committee. How many lavish dinner parties between heads of state and disgraced tabloid editors is too many? What is your voicemail password? What kind of domestic terrorist can’t even afford a real pie? Please draw a picture of your favorite celebrity caught in a hilarious sexual sting. Two respondents will be picked at random for their choice of a prize: a year-long subscription to The Sun on Sunday or 2 million pounds in hush money. Gabriel Debenedetti and Alex Klein are interns at The New Republic.